With Bin Laden dead, Pakistan threatened by internal power struggles, relationships between the United States and Pakistan at an all-time low, and as the US and Britain begin their withdrawal from Afghanistan, what are the possibilities-and hazards-facing the worlds most unstable region? Where is the Taliban now, and how do they figure in the future of Pakistan as well as Afghanistan? What does the immediate future hold, and what are the choices that Pakistan, Afghanistan and the West can make? These are some of the crucial questions that Ahmed Rashid takes on in this follow-up to his acclaimed Descent into Chaos. Rashid correctly predicted that the Iraq war would need to be refocused into Afghanistan, and that Pakistan would emerge as the leading player through which American interests and actions would have to be directed. 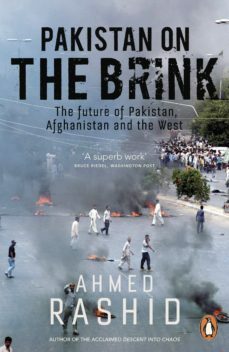 Now, as Washington and the rest of the West wrestle with negotiating with unreliable and unstable "allies" in Pakistan, there is no better guide to the dark future than Ahmed Rashid. He focuses on the long-term problems: the changing casts of characters, the future of international terrorism, and the actual policies and strategies both within Pakistan and Afghanistan and among the Western allies. As he has done so well in the past, Pakistan on the Brink offers sensible solutions and provides a way forward for all countries involved, while the world tries to bring some stability to a fractured region saddled with a legacy of violence and corruption.